During the Niku IIII expedition in August 2001, Stuart Hay, the son of New Zealand Pacific Aviation Survey Expedition participant Royal New Zealand Navy Acting Petty Officer M.H. 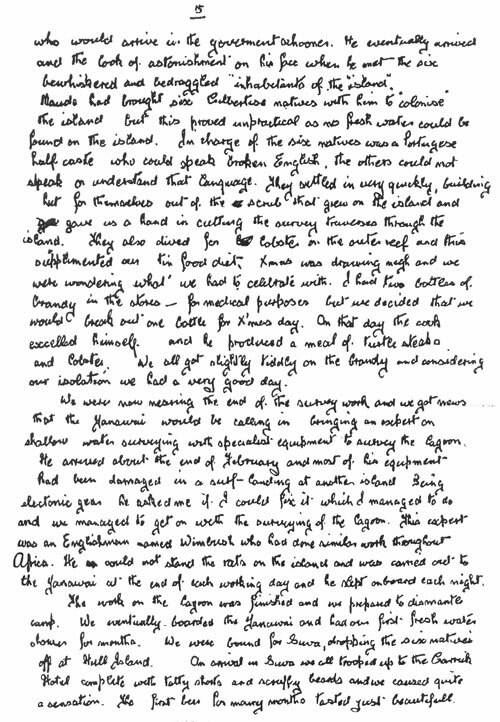 Hay, faxed TIGHAR copies of what he described as excerpts from his father’s journal describing his experiences on Gardner Island. Unfortunately, Mr. Hay neglected to send one page of the journal so we’re missing a piece of the story. 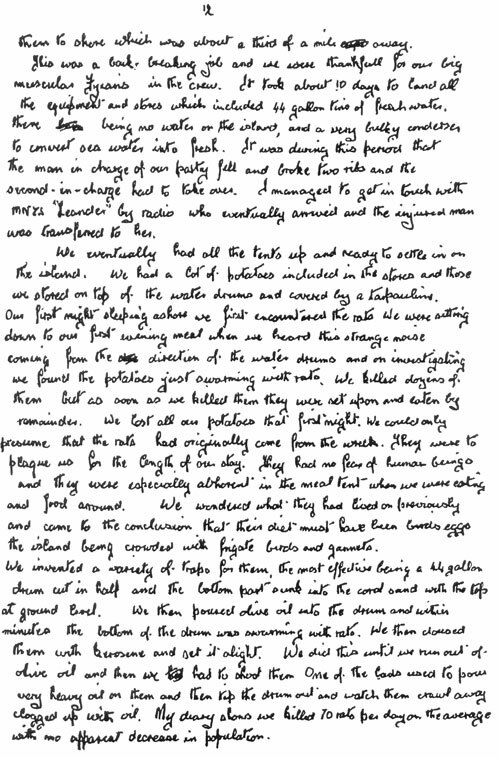 If and when we get the missing page we’ll update this document. The journal is clearly not a contemporaneous record of events but a later recollection. It is written entirely in the past tense and many of the details do not agree with other sources. Nonetheless, it provides some interesting insights into to the more personal aspects of the expedition. 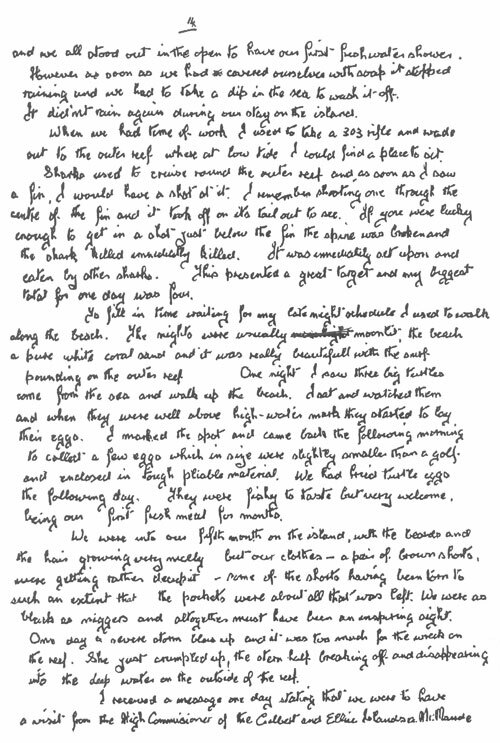 The thumbnails below are links to JPEG images of our copies of the original hand-written journal. Click on each image to view the larger version in a new window. Below these links is a transcription of the text of the report for easier reading. … times exploring this facinating [sic] historic island. Lieutenant Commander Banko told me to chose [sic] a merchant ship to go back to NZ and I chose a one-class ship named the Morton Bay, and we sailed to Sydney via Colombo and Freemantle. The Epinosa Ballet Co were sailing on the Morton Bay and the young bloods on board persuaded Espinosa to train them for a male ballet troupe. He really trained us and we were much the better for it. The show we put on went down well with the remainder of the passengers. From Syndey I took passage on the Wanganella for Auckland. After two and a half months leave I was posted to HMNZS Leander and spent the next few months cruising the South Pacific. 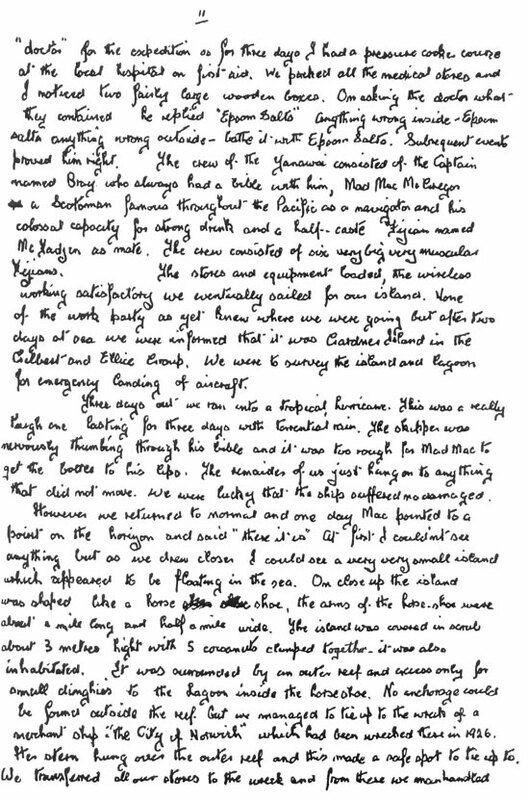 In July 1938 we sailed for Suva loaded with equipment and provisions. Whilst on passage to Suva the Captain called for me and told me what all the equipment and provisions were for. 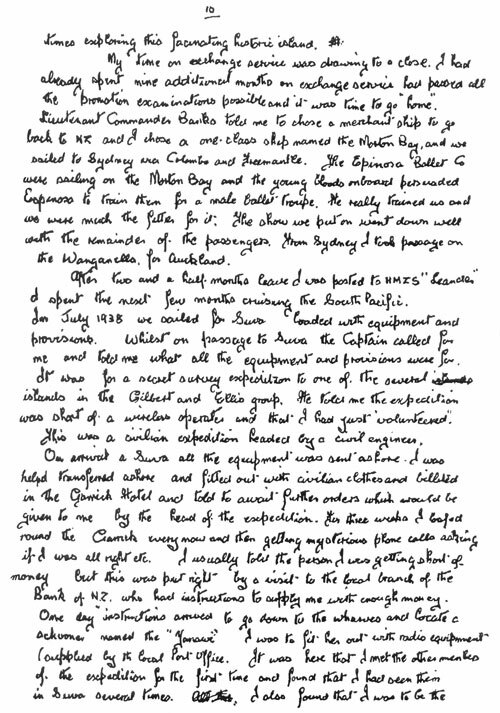 It was for a secret survey expedition to one of the several islands in the Gilbert and Ellis [sic] group. He told me the expedition was short of a wireless operator and that I had just “volunteered.” This was a civilian expedition headed by a civil engineer. On arrival at Suva all the equipment was sent ashore. I was also transferred ashore and fitted out with civilian clothes and billeted in the Garrick Hotel and told to await further orders which would be given to me by the head of the expedition. For three weeks I loafed around the Garrick every now and then getting mysterious phone calls asking if I was all right etc. I usually told the person I was getting short of money but this was put right by a visit to the local branch of the Bank of NZ who had instructions to supply me with enough money. One day instructions arrived to go down to the wharves and locate a schooner named the Yanawai. I was to fit her out with radio equipment (supplied by the local Post Office). It was here that I met the other members of the expedition for the first time and found that I had seen them in Suva several times. I also found that I was to be the “doctor” for the expedition as for three days I had a pressure cooker course at the local hospital on first aid. We packed all the medical stores and I noticed two fairly large wooden boxes. On asking the doctor what they contained he replied “Epsom Salts.” Anything wrong inside – Epsom Salts. Anything wrong outside – bathe it with Epsom Salts. Subsequent events proved him right. The crew of the Yanawai consisted of the Captain named Bray who always had a bible with him, Mad Mac McGregor, a Scotsman famous throughout the Pacific as a navigator and his colossal capacity for strong drink and a half-caste Fijian named McFadjen [?] as mate. The crew consisted of six very big very muscular Fijians. The stores and equipment loaded, the wireless working satisfactory we eventually sailed for our island. None of the work party as yet knew where we were going but after two days at sea were informed that it was Gardner Island in the Gilbert and Ellice Group. We were to survey the island and lagoon for emergency landing of aircraft. Three days out we ran into a tropical hurricane. This was a really tough one lasting for three days with torrential rain. The skipper was nervously thumbing through his bible and it was too rough for Mad Mac to get the bottle to his lips. The remainder of us just hung onto anything that did not move. We were lucky that the ship suffered no damages. However we returned to normal and one day Mac pointed to a point on the horizon and said “there it is.” At first I couldn’t see anything but as we drew closer I could see a very very small island which appeared to be floating in the sea. On close up the island was shaped like a horse shoe, the arms of the horse shoe were bout a mile long and half a mile wide. The island was covered in scrub about three meters high with five coconuts clumped together. It was also uninhabitated [sic]. It was surrounded by an outer reef and access only for small dinghies to the lagoon inside the horseshoe. No anchorage could be found outside the reef but we managed to tie up to the wreck of a merchant ship “The City of Norwich” which had been wrecked there in 1926. Her stern hung over the outer reef and this made a safe spot to tie up to. We transferred all our stores to the wreck and from there we manhandled them to shore which was about a third of a mile away. This was a back breaking job and all were thankfull [sic] for our big muscular Fijians in the crew. It took about 10 days to land all the equipment and stores which included 44 gallon tins of fresh water, there being no water on the island, and a very bulky condenser to convert sea water into fresh. It was during this period that the man in charge of our party fell and broke two ribs and the second-in-charge had to take over. I managed to get in touch with HMNZS Leander by radio who eventually arrived and the injured man was transferred to her. We eventually had all the tents up and ready to settle in on the island. We had a lot of potatoes included in the stores and those we stored on top of the water drums and covered by tarpaulins. Our first night sleeping ashore we first encountered the rats. We were sitting down to our first evening meal when we heard this strange noise coming from the direction of the water drums and on investigating we found the potatoes just swarming with rats. We killed dozens of them but as soon as we killed them they were set upon and eaten by the remainder. We lost all our potatoes that first night. We could only assume that the rats had originally come from the wreck. They were to plague us for the length of our stay. They had no fear of human beings and they were especially abhorent [sic] in the meal tent when we were eating and had food around. We wondered what they had lived on previously and came to the conclusion that their diet must have been birds eggs, the island being crowded with frigate birds and gannets. We invented a variety of traps for them, the most effective being a 44 gallon drum cut in half and the bottom part sunk into the coral sand with the top at ground level. We then poured olive oil into the drum and within minutes the bottom of the drum was swarming with rats. We then doused them with kerosene and set it alight. We did this until we ran out of olive oil and then we had to shoot them. One of the lads used to pour very heavy oil on them and then tip the drum out and watch them crawl away clogged up with oil. My diary shows we killed 70 rats per day on the average with no apparent decrease in population. … had covered ourselves with soap it stopped raining and we had to take a dip in the sea to wash it off. It didn’t rain again during our stay on the island. When we had time off work I used to take a .303 rifle and wade out to the outer reef where at low tide I could find a place to sit. Sharks used to cruise round the outer reef and as soon as I saw a fin, I would have a shot at it. I remember shooting one through the centre of the fin and it took off on its tail out to sea. If you were lucky enough to get in a shot just below the fin the spine was broken and the shark killed immediately killed [sic]. It was immediately set upon and eaten by other sharks. This presented a great target and my biggest total for one day was four. To fill in time waiting for my late night schedule I used to walk along the beach. The nights were unusually moonlit; the beach a pure white coral sand and it was really beautifull [sic] with the surf pounding on the outer reef. One night I saw three big turtles come from the sea and walk up the beach. I sat and watched them and when they were well above high water mark they started to lay their eggs. I marked the spot and came back the following morning to collect a few eggs which in size were slightly smaller than a golf ball and enclosed in tough pliable material. We had fried turtle eggs the following day. They were fishy to taste but very welcome being our first fresh meal for months. We were into our fifth month on the island, with the beards and the hair growing very nicely but our clothes — a pair of brown shorts — were getting rather decrepit — some of the shorts having been torn to such an extent that the pockets were about all that was left. We were as black as n*****s and altogether must have been an inspiring sight. One day a severe storm blew up and it was too much for the wreck on the reef. She just crumpled up, the stern half breaking off and disappearing into the deep water on the outside of the reef. I received a message one day stating that we were to have a visit from the High Commissioner of the Gilbert and Ellice Islands, a Mr. Maude who would arrive in the government schooner. He eventually arrived and the look of astonishment on his face when he met the six bewhiskered and bedraggled “inhabitants of the island.” [sic] Maude had brought six Gilbertese natives with him to “colonise” the island but this proved unpractical as no fresh water could be found on the island. In charge of the six natives was a Portugese half-caste who could speak broken English. The others could not speak or understand that language. They settled in very quickly, building a hut for themselves out of the scrub that grew on the island and gave us a hand in cutting the survey traverses through the island. They also dived for lobster on the outer reef and this supplemented our tin food diet. Christmas was drawing nigh and we were wondering what we had to celebrate with. I had two bottles of brandy in the stores — for medical purposes but we decided that we would break out one bottle for X’mas day. On that day the cook excelled himself and he produced a meal of turtle steak and lobster. We all got slightly tiddly on the brandy and considering our isolation we had a very good day. We were now nearing the end of the survey work and we got news that the Yanawai would be calling in bringing an expert on shallow water surveying with specialist equipment to survey the lagoon. He arrived about the end of February and most of his equipment had been damaged in a surf landing at another island. Being electronic gear, he asked me if I could fix it which I managed to do and we managed to get on with the surveying of the lagoon. This expert was an Englishman named Wimbush who had one similar work throughout the area. He could not stand the rats on the island and was carried out to the Yanawai at the end of each working day and he slept on board each night. The work on the lagoon was finished and we prepared to dismantle camp. We eventually boarded the Yanawai and had our first fresh water shower for months. We were bound for Suva, dropping the six natives off at Hull Island. On arrival in Suva we all trooped up to the Garrick Hotel complete with tatty shorts and scruffy beards and we caused quite a sensation. The first beer for many months tasted just beautifull [sic].